Twisted band engagement rings are romantic and symbolic, representing the endless journey of you and your beloved as two hearts merge into one. This style of ring has been popular for many decades, showing no sign of losing favour any time soon. Whichever style you prefer, whatever your favourite metal or stone, this ring is surprisingly diverse, with plenty of variations to suit just about every preference. 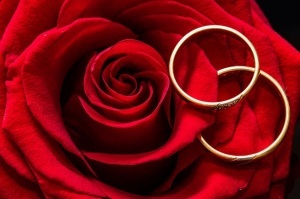 Keep reading to view our examples of beautiful twisted band engagement rings that are sure to inspire. For brides who prefer their rings simple and clean-cut, this simple twist design is delicate, non-fussy and minimal. The gentle twists of the band add detail, while the solitaire stone is able to shine without distraction. This style works well in white gold or platinum, but it would also be equally lovely in yellow or rose gold if warmer hues are more your thing. If you're looking for a bit more sparkle, a two tone ring is sure to be the ideal choice. This ring has two twisting bands, in two different tones. Each band is adorned with tiny pave stones that add maximum sparkle. 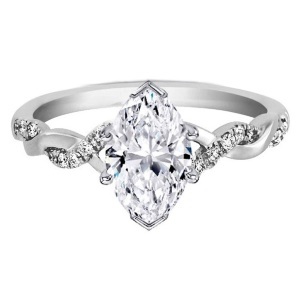 The style of this ring is also diverse, depending on the metals you choose, whether or not you add pave stones, and the type of stones you choose for the pave twists and the centre stone. Romantics and those with a love for all things vintage will adore this style. An elegant pear shaped centre stone is set in an intricate pave-encrusted twisting band, with tiny pave stones surrounding the centre stone. While this ring looks especially stunning in warmer toned metals such as yellow or rose gold, it would work well in platinum or white gold as well. This style helps to elongate the look of your finger and can be worn with the tapered end on the top or bottom of your finger. This one also has a bit of a vintage look. A classic marquise cut diamond takes centre stage, with a delicately twisted pave encrusted band that adds a bit more detail. This style works well in just about any metal – yellow gold, rose gold, white gold or platinum – and any choice of stone colour or style, too. Depending on how bold or subtle you want to go, the variations are diverse for this style. 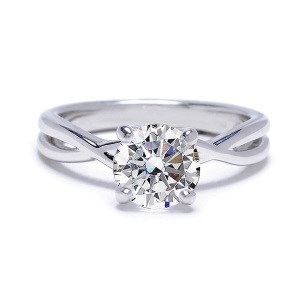 Traditionalists and those who prefer minimal rings will love this classic design. A delicately twisted band hugs a tiny centre stone in a solitaire setting, with no additional detail to distract the eye. This ring works well in any metal, with any colour or type of stone. Stick to a cool toned metal and a diamond for a classic look, or try a coloured diamond with a yellow or rose gold metal for a bolder look. 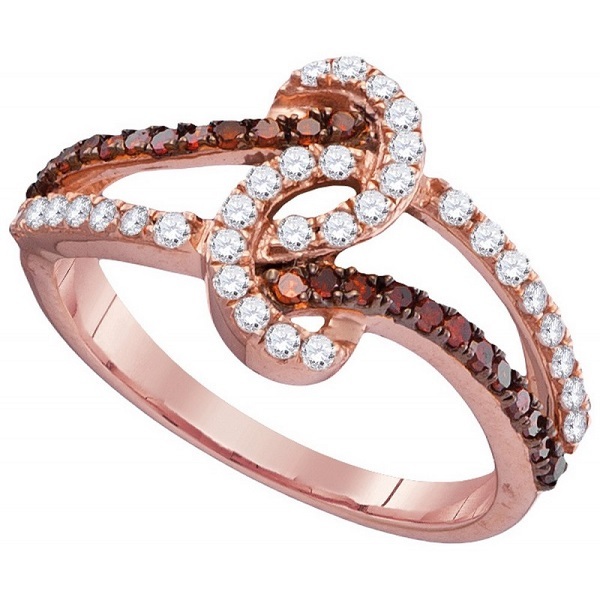 If rose gold and warmer tones are your thing, this ring is sure to be dazzling. 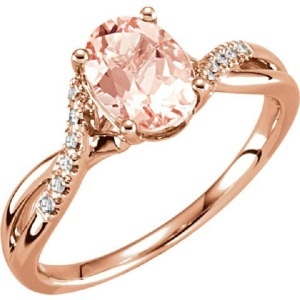 Morganite works well as the centre stone, but you could also look for a coloured diamond for a similar effect. 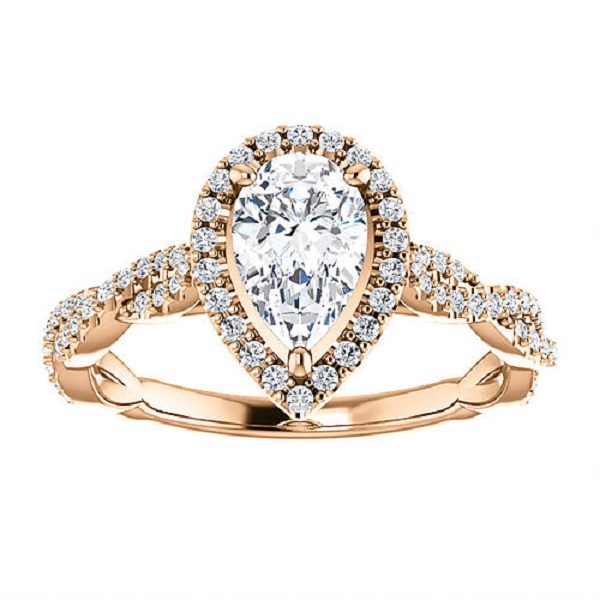 Rose gold continues the warm, rosy effect, with tiny pave stones strategically placed to create a bit of visual detail without going overboard. The final effect is romantic, feminine, and oh-so-gorgeous. The knotted pave twist does not feature a larger stone. Instead, the detail lies in the design of the band itself. 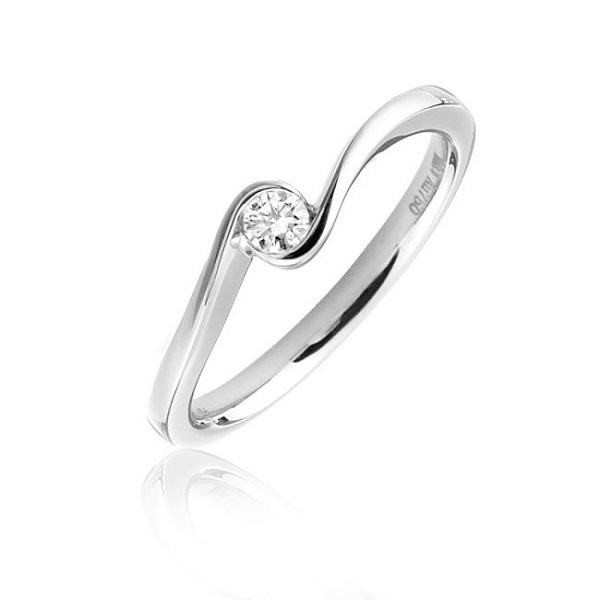 A twisted split band is knotted in an intricate design, symbolising the deeply entwined bond between you and your love. 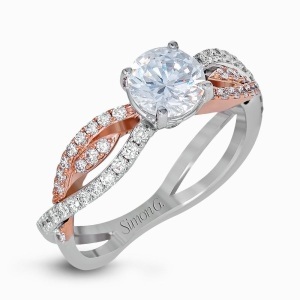 Contrasting stones, in this case chocolate and white diamonds, add even more detail, and maximum sparkle. This style would work well in any metal, with any colour or type of stone. 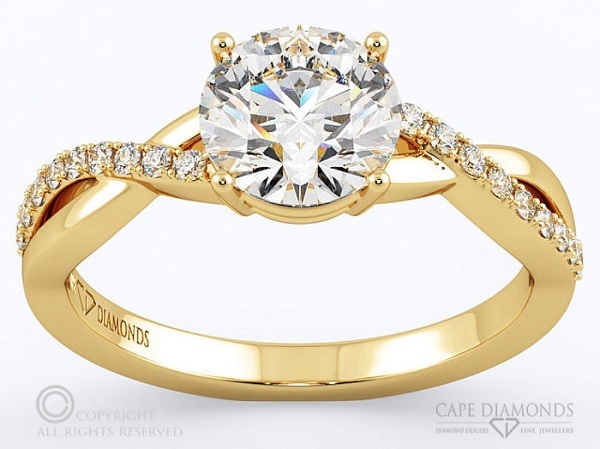 This elegant split band pave twist ring from Cape Diamonds in 18k yellow gold is the ideal choice for those who adore eye-catching rings that are timeless and beautifully crafted. 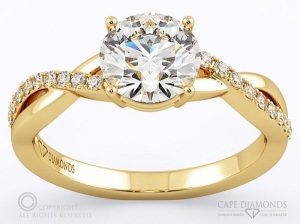 The split band twists gently to a round cut solitaire diamond, with a solid gold twist adding the final touch. If yellow gold is not your thing, this ring is available in platinum, white gold and rose gold as well. Get creative, think out of the box and consider a tailor-made twisted engagement ring from Cape Diamonds that is made perfectly to suit your style and budget.